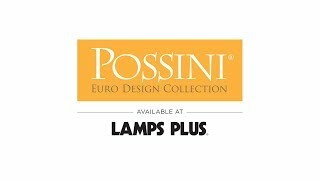 With an off-center angular metal base, this bronze floor lamp, by Possini Euro Design, is an attractive lighting design. With a strong, angular form, this off-center metal floor lamp is ideal for industrial or urban inspired home decor. Its metal base comes in a rich bronze finish and is topped with a burlap drum shade that balances the look. Two pull chain switches allow you to control the light output easily while adding a touch of traditional style. Overall: 61 3/4" high x 20" wide. Base is 10 1/2" wide. Shade is 18" wide x 9 1/2" high. Weighs 18 lbs. Uses two maximum 75 watt or equivalent medium base bulb (not included); on-off pull chain switch. 8' brown cord. Eye-catching off-center base by Possini Euro Design®.